Delivering Justice Sobhag Mal Jain Memorial Lecture on Delayed Justice on Tuesday, Justice Y K Sabharwal acknowledged delays and aging backlogs. Many a times, he said, a winner is really a loser considering the costs and years spent in courts. Supreme Court Bar Association President M N Krishnamani, in introductory remarks, criticised outright dismissal of a bulk of matters filed before the apex Court, calling it just ”quantitative” justice. A Senior Advocate, Krishnamani also criticised long adjournments, pointing out that it made little sense to adjourn a matter for a year because someone is a bit indisposed. Such practices contribute to delays, he said. Justice Sabharwal acknowledged Courts’ obligation to deliver ‘prompt and inexpensive’ justice to those who suffer physically, mentally or economically and seek redress without taking law into their own hands. But he said Indian Courts ”held in high esteem” around the world, faced ”growing criticism” at home– sometimes uninformed or ill-informed. He acknowledged how process-induced delays result in miscarriage of justice. ”Long delay,” Justice Sabharwal said, ”has also the effect of defeating justice in quite a number of cases. As a result of such delay, the possibility cannot be ruled out of loss of important evidence, because of fading of memory or death of witnesses. He said delay in disposing of cases affected not only ordinary cases but even those which by their very nature, call for early relief. ”The problem of delay and huge arrears stares us all and unless we can do something about it, the whole system would get crushed under its weight,” Justice Sabharwal said. At the same time, he said, ”we must guard against the system getting discredited and people losing faith in it and taking recourse to extra legal remedies with all the sinister potentialities. ”Many times such inordinate delay contributes to acquittal of guilty persons either because the evidence is lost or because of lapse of time, or the witnesses do not remember all the details or the witnesses do not come forward to give true evidence due to threats, inducement or sympathy. Experts have long voiced concern over poor conviction rate– 6.5 per cent– in heinous crimes as a factor that encourages criminal behaviour rather than deter it. But, he said, courts have no magic wand to wipe out the huge pendency of cases nor can they ignore injustices and illegalities. He said volumes of Law Commission recommendations and expert reports have not enabled the system to bridge the gap between institution and disposal of cases or even make a dent in the mountain of arrears. The inadequacy of research on Indian legal and judicial system was also criticised by Governor Kokje who said he was trying to help remedy it in Himachal institutions. Presumably alluding to Law Commission suggestions to quintuple the number of Judges, he pointed to judicial vacancies and said if finding ten judges is difficult where would one find fifty. Among steps Justice Sabharwal stressed were filling high court vacancies, setting up more courts, holding courts in two shifts, managing caseloads, giving judiciary financial autonomy, settling disputes through mediation and other ways and plea bargaining. Justice Sabharwal suggested making it a practice to estimate additional facilities needed to adjudicate rights and offences new laws create– as Americans do. He also suggested using computers, Internet and video conferencing, sharpening judges’ adjudicatory skills through training, curbing frivolous government litigation, framing rules for easier service of summons and making adjournments cost. For instance, the sanctioned strength of High Court Judges is 726, and the actual strength 588, leaving 138 vacancies. The sanctioned strength of subordinate judges is 14,582 and the working strength– on April 30, 2006– 11,723, implying 2,860 vacancies. He made it clear that the backlog ”cannot be wiped out without” hiring more judges, particularly when the institution of cases is likely to increase, not come down, in coming years. ”While laying stress on the urgent need of elimination of delay and reduction of backlogs, we cannot afford to act in undue haste so as to substitute one evil for another one. His message: the quality of justice must not suffer on account of quantity. New Delhi (UNI) – Asserting that judicial corruption is existent– albeit ”not rampant”– justice experts have stressed reforming the way judges are appointed and disciplined. But discussing Appointment and Removal of a Judge of the Supreme Court, panelists acknowledged last week that such reforms might be struck down by the courts as offending the basic structure doctrine. 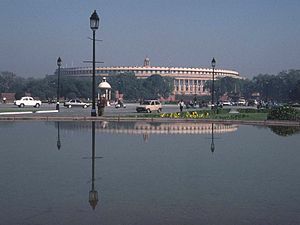 That doctrine is an offshoot of a Supreme Court ruling of April 24, 1973 that Parliament cannot amend India’s Constitution insofar as its ”basic structutre” is concerned. The panelists who included former Chief Justice of India J S Verma and former Delhi High Court Chief Justice Rajinder Sachar went over changes the government proposes to make in law. The other panelists: former Attorney General Soli Jehangir Sorabjee, senior advocates K K Venugopal and A K Ganguly and journalist Harish Khare. The Judges (Inquiry) Bill, 2006 now before Parliament seeks to establish a National Judicial Council to look into allegations of misbehaviour or incapacity of the Judges of the Supreme Court and the High Courts; regulate the procedure for such investigation, inquiry and proof; and provide for minor disciplinary measures. Key changes allow complaints against errant judges– to be rejected or processed by a judges forum– resulting in either minor measures or removal. Reform is also intended to introduce transparency in judges’ appointments, a process mired at present in opacity. Over the past few weeks, for instance, President A P J Abdul Kalam has raised queries on two senior judges’ appointments– reflecting incongruities in the process at work. ”There is an urgent need of a legislation for establishing a National Judicial Council,” Law and Justice Minister Hans Raj Bhardwaj has noted in the Objects and Reasons of the Bill. He said it was based on judicial independence, a fundamental of the Constitution inseparable from judicial accountability. Sorabjee wondered how former CJI S P Bharucha arrived at a figure of 20 per cent judges being corrupt– an estimate some of his successors have tended to discount. Some three years ago the Bar Council of India, the statutory body of the nation’s million or so lawyers, demanded transfer of 130 judges– nearly a fifth of incumbents– from High Courts where their kin practise. The practice is among don’ts spelt out under the BCI Rules of Standards of Professional Conduct and Etiquette. Critics say by most standards any sort of misconduct by a learned Judge should be unimaginable. They cite a Delhi HC Additional Judge whose resignation brought to the fore allegations that he availed himself of indecent hospitality while the host wrote a ‘judicial’ order in his name in an adjacent room. Critics say that since a Supreme Court judgement in 1993, the onus of appointing Judges is on the judiciary, but no responsibility is fixed for lapses by selectors. Justice Verma spoke of a perception that what the executive did when it controlled the hiring process is now done by the judiciary, although there may be a difference of degree. The CJI, he said, is essentially no different from other Judges but such exclusion may send out a signal to the contrary. Most speakers opposed a limitation proviso in the Bill which seeks to disallow complaints arisen before the enactment. Hailing the complaint provision, Venugopal said once a show cause goes out to a Judge, all other Judges would ”sit back and take notice”. He said the very fact of notice would have a salutary effect on Judges, but Sorabjee did not appear to think so. Venugopal acknowledged the probability that the reform might not go far. ”It may be struck down.” Khare stressed that the judiciary set its house in order. Sachar said there was ”no need for appeal” provided in the proposed draft against a disciplinary decision taken after an elaborate procedure. Ganguly questioned long gaps in appointing Judges. He said at times senior advocates sounded for judgeship did not hear about it again for years. Ganguly suggested letting the Prime Minister preside over the group that selects Judges, but the idea was considered inappropriate by another panelist as the Prime Minister is head of the government which is often a litigant. Concluding the discussion, the panelists told the mostly lawyer audience to ”think about” the issues– but allowed no questions. An advocate who sat through the discussion said afterwards the key problem with the system was appointments made from a close circle of professionals– what he dubbed ”judicial inbreeding”. Ravi Mohan acknowledged in reply to a question that his assertion was not based on an academic or administrative study but his empirical experience. The remedy: make the system transparent, he said, adding that all consideration in respect of an appointment from the first step– inviting biodata– onward must be public knowledge.